Alfreda Adgerson, a lifelong Washington, D.C, resident spent the better part of her adult years taking care of her cancer-stricken mother in the home the two lived in near Capitol Hill. When her mother, who owned the home, tragically passed away in the late 1990s, a family struggle over the home ensued in court and left Adgerson without a stable residence. She moved in with her son soon afterward, but longed to live independently. Fortunately, Adgerson, now 67, found Mission First’s Golden Rule Apartments at 901 New Jersey Ave. NW, where she has lived since 1998. It’s a perfect centralized location for her due to its proximity to stores and public transportation stops. Adgerson, who has dealt with a series of ailments in recent years, including a fractured kneecap, is particularly fond of Golden Rule’s proximity to public transportation. But, as Adgerson knows all-too well, life can throw some curveballs and have some unexpected bumps in the road. Despite her federal government pension, Adgerson will be the first person to tell you that she is not a person of great wealth. Due to piling-up medical and cost-of-living expenses, Adgerson, who was retired from her work for the federal government, was forced to find a job. Finding a job in this day and age can be tough for anyone, let alone a senior citizen. 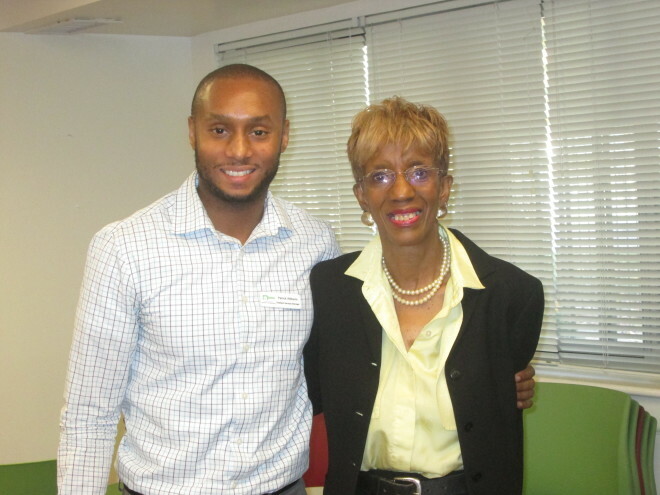 But the process was much easier thanks to resident services manager Patrick Williams, who encouraged Adgerson to attend a local job fair. She is now working full-time at a tourist bus company. Williams commended Adgerson for her hard work and the successful tenure she’s had at Golden Rule thus far. He feels she is an excellent role model for other residents, as her success can inspire others with the same‘do-it-myself’ attitude. Williams is happy to see residents reaching out to the Resident Services Department when they need assistance. Adgerson had more high praise for the events Williams puts together that brings the entire Golden Rule community together. While Williams appreciates the high praise, he has some of his own for Adgerson. He feels she is the embodiment of what the resident services department sets out to be. “Resident Services strives to go above and beyond to assist residents by more than just referrals and providing employment openings,” Williams said. “We strive to provide them the emotional and motivational support they need to move forward and strive for excellence. In the end, Adgerson was able to sum up her Golden Rule experience in a succinct but powerful sentence.